Hi, I have one last card to share using the Magical Mermaid stamp set. 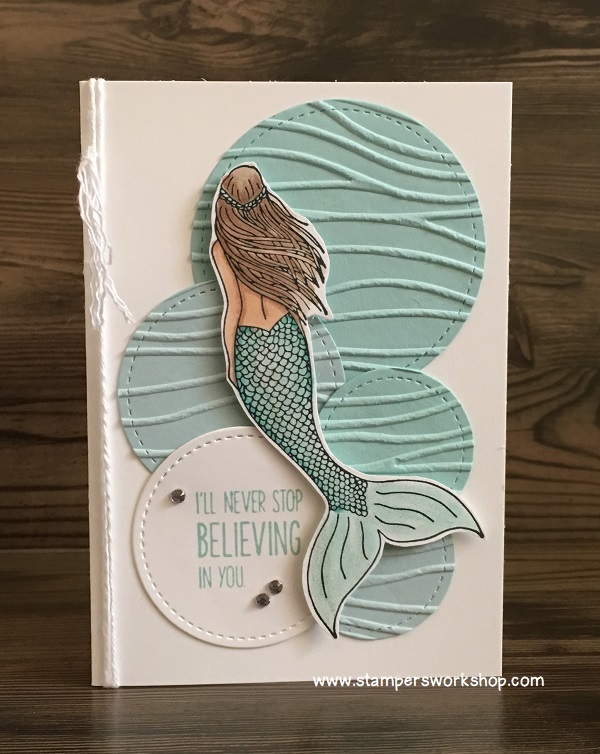 I used another mermaid I had coloured when practising with the new Stampin’ Blends (coming November 1, 2017 – yay!). I was experimenting with colours – don’t you think she looks great in a pink colourway?! I also wanted to pop her up and have her look back to the sentiment. In order to allow the greeting to show through from behind, I cut out a circle from the Pool Party Cardstock. I then placed this cardstock into the Seaside Textured Impressions Embossing Folder and ran it through the Big Shot. This is definitely one of my favourite embossing folders. I made some light pencil marks to the card base so I could see where my stamping needed to go. I stamped the sentiment and the seaweed in this space. I added Stampin’ Dimensionals to the back of the embossed cardstock and this piece to the card base. 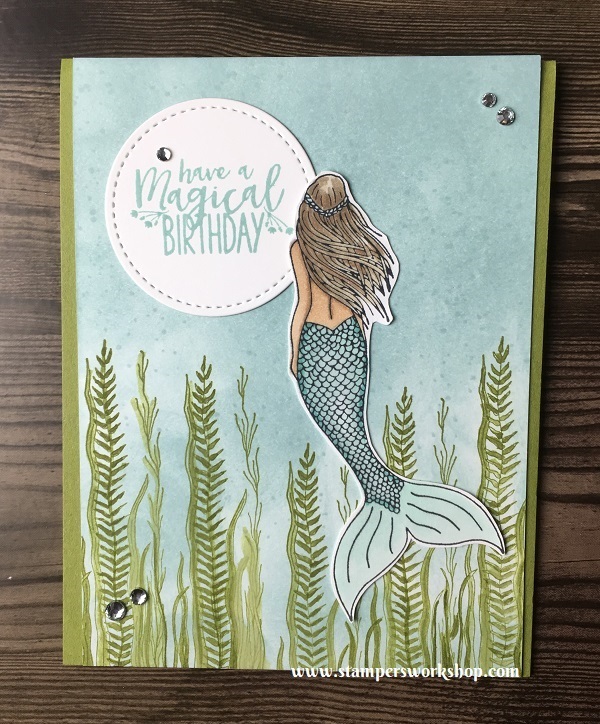 I popped up the mermaid but the card didn’t seem quite finished. I added some bling (rhinestones) but it still needed one more thing and this is when I realised the starfish (from one of the other sentiments in the set) would be the finishing touch. 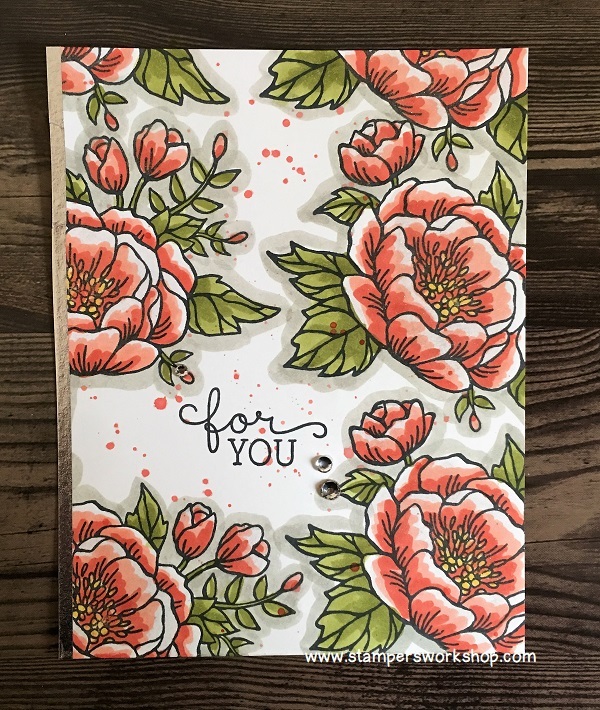 Hi, if you have followed my blog for any length of time you know that I love trying to get value for money from any product I buy which means I create a lot of cards using the one set. I also like to tweak my designs and often times change only a few features. Today’s cards are two examples of this. I’ve used the same design, however, I have played around with the colours. 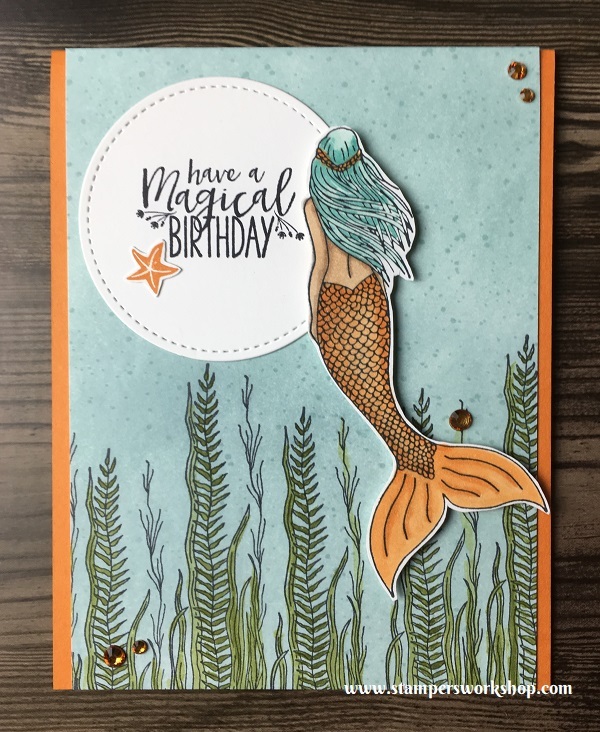 For the first card, I coloured the mermaid using the new Stampin’ Blends (which will be available on November 1, 2017 – yay!). I cut her out and put her aside. I stamped the seaweed along the base of the card using Old Olive ink. I sponged the rest of the background with Soft Sky. Don’t worry if the background is a little splotchy in places, I think this adds a bit of visual interest. I then painted the seaweed with more Old Olive ink. The ink will react with the water so be careful not to use too much water. I stamped the sentiment and cut it out using a stitched circle die. I then assembled the card and added a few rhinestones to finish off the card. So for my second card, you’ll notice the overall design is the same, however, there are a number of differences. Never be afraid to remake a card changing only a few elements. It’s a great way to see what works. In this example, I’ve changed the colour scheme. I’ve popped up the mermaid. I’ve stamped the sentiment in a larger circle which gave me the opportunity to add the starfish element. I added some more bling but this time I made it match the colour scheme (and you are going to LOVE the Stampin’ Blends as I used these to colour the rhinestones). I hope posts like these encourage you to try different things when creating with your stamps. I really want you to get true value from all of your supplies…and I think it is fun trying out different variations. 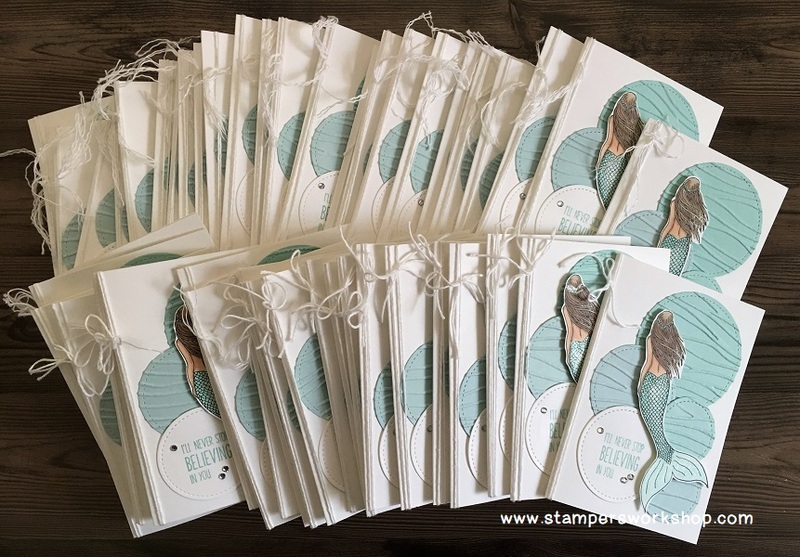 Hi, did any of you stock up on the Note Cards and Envelopes during the World Card Making Day sale? I hope so! I did! 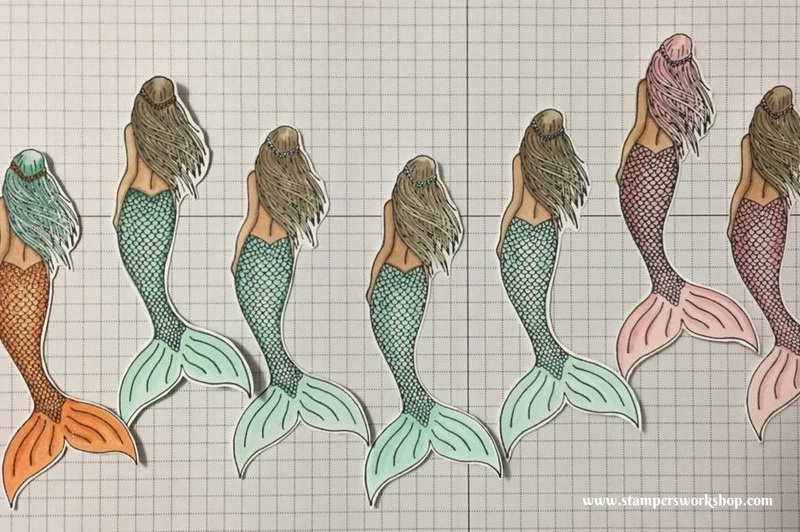 As I still have quite a few of the mermaids from the Magical Mermaid stamp set coloured from my practice session with the new Stampin’ Blends (see post here), I thought she would be a perfect addition to one of the note cards. 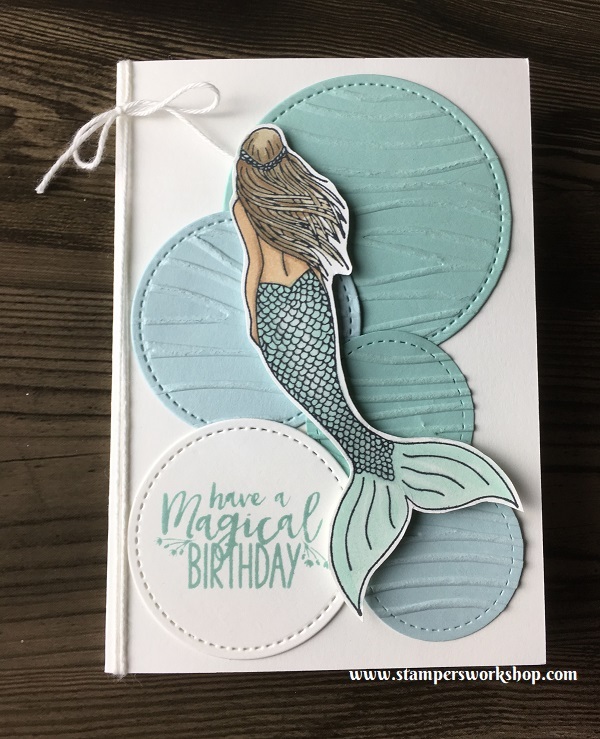 I had die cut out some stitched circles from Whisper White cardstock to create another card and it crossed my mind that the circles could be seen to be water bubbles. With that, I cut out more circles from Pool Party and Soft Sky cardstock. Layering them on the notecard I thought the design was cute but lacked a little dimension. The Seaside Textured Embossing Folder came to the rescue! I ran all of the circles through the Big Shot and voila! Instant texture! It isn’t a fancy card, but I think it is a cute one and one that was super easy to assemble! I hope you’ll give it a try! Hi, last week I was excited to receive my new Stampin’ Blends! 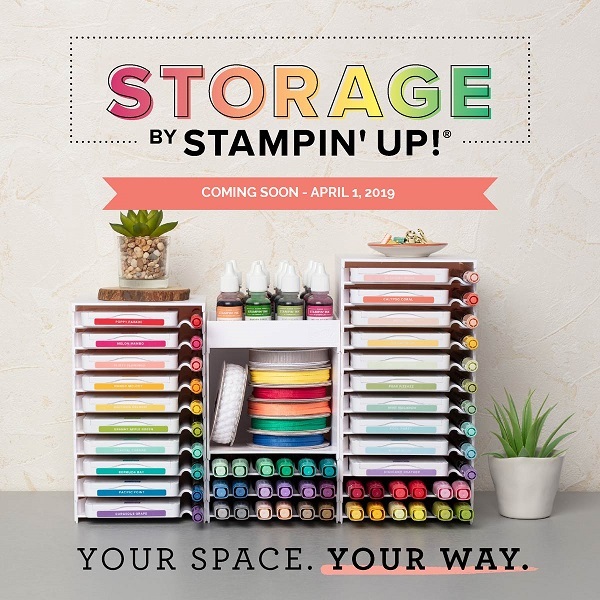 They are brand new alcohol markers from Stampin’ Up! They are not available for sale to customers YET but you can get them until the 15th October 2017 if you are a demonstrator (so now is a perfect time to join my team). I really wanted to colour with the markers so I grabbed the Magical Mermaid set which I had been wanting to use for a long time. I coloured up a storm! 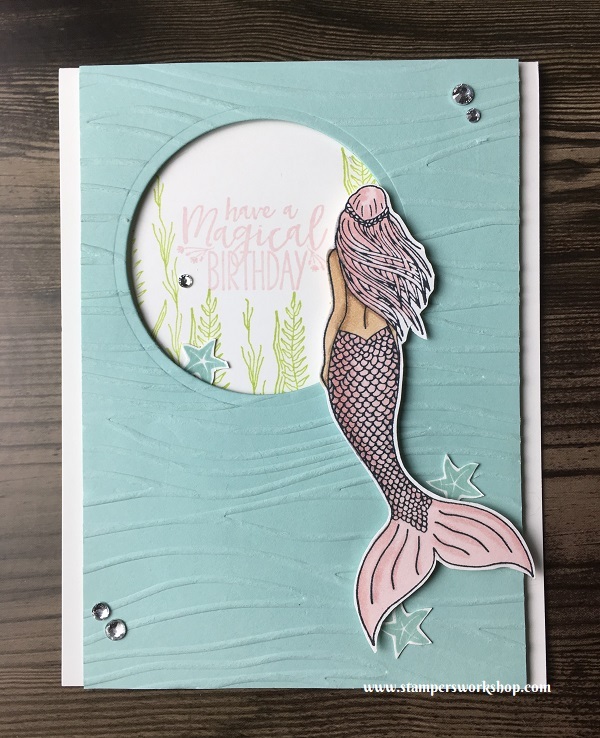 The sweet mermaid image is fun to colour (and the Stampin’ Blends are great! I cannot wait to share more with you!). I shared a photograph on my Facebook page on Sunday showing some of my colouring of this image. I got a little carried away but it is just so much fun. Here’s the picture. Don’t they look pretty! Of course, it is great to colour for the sake of colouring. I love it. No pressure, just fun! However, I also love making cards! (So, yes, I have a few mermaid cards coming your way). The card I am sharing today is a very simple one. I wanted to keep it soft and pretty and make the mermaid the focus. I embossed the seaweed using white embossing powder and then painted some of the areas with Pool Party ink to give it a bit of a lift. 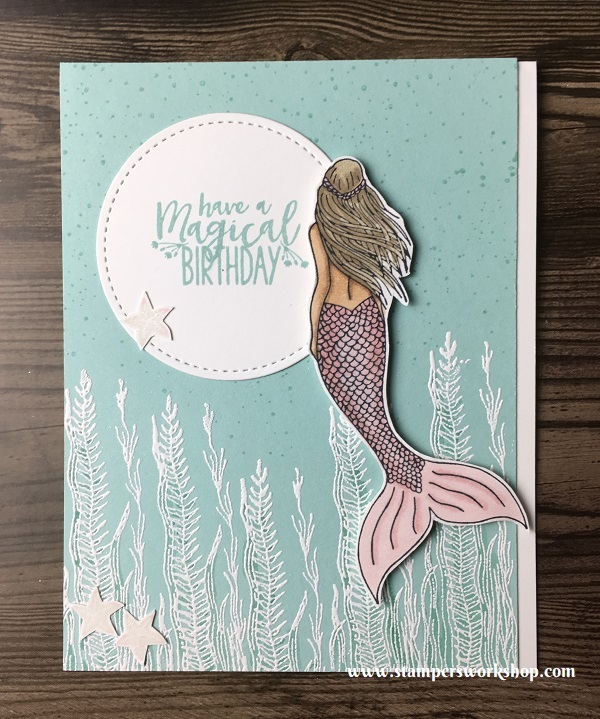 I cut out the starfish from one of the greetings in the set as I thought the card needed a little more of the Pink Pirouette I had used to colour the mermaid. Isn’t it sweet! A nice and simple card which didn’t take very long to put together. The design is also one of my favourites – very versatile! 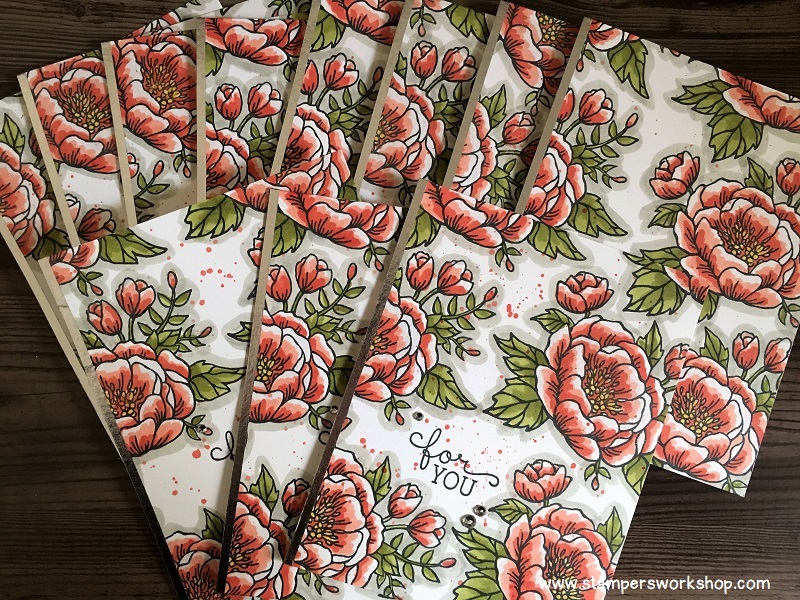 If you are interested learning a little more about the new Stampin’ Blends, you can check out my Facebook Live video (and oops! It is sideways!) to see more.